Core: Dooms Day Bomb 2. Lane #1 inroduces a new force in the bowling industry that outhooks all others. The BuzzBOMB is packed with our all new double sided Dommsday Bomb2 core. This Doomsday double Bomb core generates double the torque, creating double the hook on the backend. Surrounding this nuclear power plant is our all new Pure-Grip solid reacive coverstock. This new formula grips the lane on the heaviest oil. You won''t believe your eyes when you see this midlane Hook Monster explode with a Huge Backend. 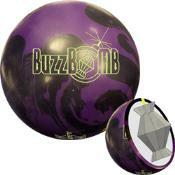 Hear the Buzz, see the Hook, watch your High Scores double with the BuzzBOMB!!! First I'd like to thank Chuck and Richie for getting me this ball ahead of time and taking the 20 minutes to talk to me regarding layout and coverstock prep. I started off with this ball in box finish and tried it out. Just stood left and tossed the ball at the gutter...the logs made it VERY easy to see where the ball started hooking....that was about 20 feet. Revved very hard for the next 15-20 feet and then made a VERY strong move to the pocket. I have got to say this ball moves harder at the break than any solid resin ball I have ever used. In fact this ball's move on the backend is about as angular as anything I have ever thrown...Pearl Cherry Bomb, C/2 and Silver Diamond included! Now this ball does move...A LOT! But it will recover from anywhere...it is just plain sick. I was able to cut my release and play it "straighter"...ok it still covered 20 boards. Very responsive to release changes and the patented pin-punishing Buzzsaw hit. Just plain awesome. This could well be the top selling ball of the year. Order one now.....you won't be sorry. Observations - Very strong coverstock. Outhooks anything I have. This ball was made for oily lanes. I was able to play deeper with the Buzzbomb than any other ball allows me to. The area I had from being deep inside made the scores VERY HIGH. I was playing right through the center of the oil and bouncing back into the pocket. The backend was something I haven't seen in a long time. Anything in a tad, held long enough in the oil to hit flush and carry, anything a tad right recovered w/ enough power to rip the rack apart. As the shot burned up I was able to pick up my ball speed and continue to strike and get a decent carry percentage, but it belonged in the bag or using one w/ a little less surface. I was unsure about throwing the Buzzbomb tonight because it was a light house pattern with a 4 Person per team league bowling on it before us. I was bowling in a doubles league. Once I threw a few warm up shots with my spare ball I knew the lanes were pretty toasted and the track was beat up. I committed to throwing and trying the Buzzbomb anyways. First Game - I was playing deep starting around 37 and throwing out over 22 - 23 at the arrows. Because the lanes were so burnt, I had to keep the speed up and loft the Buzzbomb slightly. The Buzzbomb responded well. I had alot of room for error. I made 3 bad shots where my release was weak. I left 1 ten pin and two multi-pin spares. Second Game - I continued to play the same shot and didn't notice the shot moving away from me. I made a few bad shots again but every pocket hit carried. Third Game was a bit of a struggle becaus I didn't move left right away. Once I made a 2-1 left I ran the next 6 and ended with a respectful 220 game. Everyone on my pair was complaining all night about the lanes. I was high man on the pair by 100+ pins. The Buzzbomb gave me the confidence and look to the pocket that I haven't seen in any other ball I have. I love having a ball that I can throw hard and be confident it will hook back to the pocket with power. I left two ten pins all night! This ball outhooks and is better than any Storm bowling ball I own or have thrown. My original X-Factor was my favorite ball of all-time, it will probably loose that ranking. I consider this ball a must have! Will report back once I've tried it polished. I drilled my buzzbomb 4 1/2 x 4. The pin is outside and above ring finger with a small weight hole. When I first through this ball I expected early roll and flat hit(just like most of the 1000 grit balls do). I was extremely surprised to see something different. I had medium length and a backend that was continuous and strong. I proceeded to roll a couple of shots inside my favorite line and I struck every time I hit the pocket. I moved in deeper to see how it would hit from a different angle and it still struck every time I hit the pocket. By now I am drawing a small crowd because everyone wants to know what I'm using that is carrying so well. I tell em the new Buzzbomb due out in about 2 weeks. Since I had a crowd and people asking me so many questions I decided to step in even further, and I swear to you I carried EVERY TIME I hit the pocket. which was often. I honestly could not believe it so I just stopped bowling and said maybe the condition was just soft today. I came back the next day on a sport pattern and continued to carry all hits to the pocket except one. PS It also turned the corner where my bite and anger labored. Let me say I am not paid for this review also I have no affiliation with Lane no1. This is an honest unbiased review from a guy with a lot of equipment and experience. After watching a few of the videos that were posted and talking to Richie about the ball. I decided to drill mine up. I have a very high tilt and good rev rate so my balls always read the backs HARD!! I took that in mind seeing how sharp this ball looked and shined the ball out of the box with my Secret Sauce. After the ball was a mirror. I layed out the ball. All I can say honestly is after being affiliated with Lane#1 for the last 5-6 years,throwing ALL of their stuff as a PBA Pro Staff Member. This is the BEST ball I have ever thrown from ANY manufacturer. Not just Lane#1. Not only does this ball turn the corner hard but the transition it makes in the midlane to get to the back is unlike anything I have seen. The ball is very versatile as far as style is concerned as well. Game#1 I was playing in and hooking the ball with medium speed. Game#2 I changed my angle to playing the track harder/straighter and more firm. This worked very well too!! Game#3 I moved in deeper than where I started the night and was playing a tight inside line. Slower speed and more tilt to get the ball to curve more in the last few feet of the lane as there is tons of oil in the middle. Keep in mind I throw 14 lbs... Not 1 weak hit all night. I had a Black Widow Solid and I would leave so many shaker 7's and weak 10's with the 14 that I had to retire it. Gave it to my GF. One of my customers on my team was throwing a Black Widow Bite I drilled yesterday for him and the motion was good. I am not trying to bash their equipment but the BUZZBOMB was stronger and more angular than even the Black Widow Bite. Official Pro Shop of "ALL" F.O.S. Members!!! Chuck, as always, is a big help for getting test balls early to us so we have an idea what to expect. Well, the teaser-ad in various magazines made very bold claims regarding the BuzzBOMB. This is supposed to be the most aggressive Lane #1 ball in quite some time. I laid it out with the pin 4 5/8" from my PAP and 2" above my midline and the cg 3" from my PAP (for me, this works out to be a 45 degree tilting of the core). It needed a hole, so I put it 2 3/4" below my axis point. All the claims from the ad were confirmed when I threw this ball. This is definitely the most hook of any Buzzsaw I've thrown. In box finish, you definitely need oil in the front part of the lane. You can count the number of balls that are able to handle the swamp in the middle of our house shot on one hand, and this is definitely one of them. I had to use a breakpoint further in the middle of the lane because if I missed a pinch to the right, the ball would overhook. This ball was truly fun to throw. For straight players who need to have the ball do as much work as possible, or crankers who love to send it and bend it, this ball is for you. Supreme hook, huge backend, and the big time Lane #1 carry. pin to pap 4.5. drilling angle 60*, angle to val 30* this results in a pin above ring finger, slightly to the right of ring, cg stacked, with a pin buffer of roughly 3.5"
Likes: non stop motion... very strong. for 1000 grit it cleared the fronts very well. hits very hard..
have to say this is the strongest ball i have thrown... my house shot will not allow me to use it to often.but did use it at anouther center played very deep and got 3 games out of it... with 300 middle game.. and did get thru the last game.. ( might have been to much late in the third ..)as for the surface looks like a little polish will get you some length and recovery in the backs for house shotsor just leave it as is and bring on the oil. .. home run if you are loking for heavy oil ball.. I just received my Buzzbomb today and ran it over to my ball driller, Otis Pillow Pro Shop in Hurst Texas to have it drilled up. The ball was 16lbs.1oz. with 3.5 oz. top and a 3-4" pin. I told Billy that I wanted a beast, and we looked over my other balls and decided on pin above index and cg, and mb kicked out at about 45deg. I am a med. to low rev stroker with good speed 15.5-17.5mph at the pins and a pretty high track. The ball ended up at 15lbs.13 1/4oz. total weight with 15/16oz. side, 3/4 finger, 1/8 thumb and just a tad bottom and no weight hole for now. I then ran immediatly to league at another house threw two practice shots and decided to give it a go, which I usually never do. This ball is very very strong and even though my series was not all that high (604) I was the high series on our set. The ball gets very good length which really suprised me and makes a left turn RIGHT NOW at the end of the pattern. The lanes were a lot more oily than usual and was quite the topic of discussion but to be honest I did not really notice it, all I did was stay behind the ball and ease up on the speed and shot standing 23 looking 10-12 at the arrows and swinging out to between 5 and 2, I was able to use it all three games with minor adjustments left operator error kept the series low ( it was the indian not the arrow,lol ). I am very impressed with this ball and would highly recommend it to anyone, especially strokers like me. OK, this is my 1st review so bear with me. Lefty 16 mph, 4 1/2"-> 1/2" up PAP. Decent revs. Bowling on burned up house shot from the night before. Proanvil surface. Standing 30 playing 20 out to 10. 1st game (ball was polished after it was drilled with the secret sauce) ball got through the heads very nice and came back very hard off the dry- 214. 2nd game-took the polish off with a gray pad cuz it was way too snappy on the backend-whoa-what a difference-still got through the heads and had more of an arc instead of a snap-235-one bad shot(open). Last game started with the 1st 5, left a 6 pin (missed way left-said oh sh*t)thought it was going in the ditch-hit the dry and came back a little high-left a 7 pin on last shot. Can't wait to see what its going to do on the fresh. Ball is 14lbs. 3" pin 3 oz. tw. Drilled pin over and in between fingers about an inch, cg kicked out just a little. Special thanks to Dan (deadmoney) for getting and drilling it for me. This is my first Lane #1 ball and now probably won't be my last. Never believed the hype till now. My house recently starting putting down much more oil than usual and I couldn't adjust and keep up so I decided on the BB. Drilled it 4x4, pin under ring...decided to us it in OOB condition, ball recovered from anywhere, but miss left and you pay for it, ball is just too strong to miss left...will definitely use some Beans on it for next week to tame it down a little. Now I know what everyone means by "Lane #1 carry" because this carries everything. My ususal "go to" ball was my NVS and this is much stronger than that by a good 6 or 7 boards for me...ball looks to be very promising, will update my review after I use it with some polish next week. had to speed up to 18 mph and move 22 to 11 and it hooked back to pocket like it was on a rail. carry is like every lane 1 ball i have and the pins exploded. i got my g force solid out that is drilled the same and the buzzbomb was able to play deeper and finished stronger in the soup. the ease of this ball reving up is unreal. i'll be thowing it on wood lanes w/guardian overlays this weekend and on brunswick pro synthetic lanes. will report more after more games with it. so far. this ball is a beast. may have to polish it up to to get more length. When you need RAW POWER and CONTROL. Just BOMB IT! Drilled my initial BuzzBOMB with Pin under ring finger. Pin to Axis is 4 3/4". CG to Pin 4". Estimated Mass Bias (6 3/4" from pin thru c.g. is 4 3/4" from Axis point) Weight Hole is 2 1/4" below axis drilled on a 1" pitch toward bottom of ball angled directly away from the center of the grip. The low hole and angle increases torque at the break point. This Ball has good change of direction even though it seems as if it rolls heavy in the mid lane. This ball is very agressive and has excellent pin carry. My first two sets were above 750 on slightly tighter than average house pattern. 42 ft of oil on HPL surface. I have drilled many more for others since I drilled mine. I like the pin position below the fingers but I do not like to push the pin past the grip area (to the right for right handers) This ball is so strong that when doing this there is a chance the ball will burn up too early. The 4 1/4" to 5 1/4" pin to axis measurements seem to work best for this ball. Not that you can't use 3 3/8" I just don't recommmend it unless your bowling on a flood or you have excessive ball speed. Keeping the starting CG low using a long pin and low hole works great, this keeps the mass bias well away from the axis point giving the break point shape more angularity. This ball has impressed me more than any other in years. I have drilled so many out of the box 300's and 800's its almost uncanny....I would recommend it to anyone. Remember to pay attention to static weights, especially in the ball like this that is symmetrical without the large offset in the core. Positives act like positives and negs act like negs...no hocus pocus here. The ball does what its supposed to do...strike..alot! I took this ball out of the box and polished it straight away using Lane#1's Secret Sauce. I drilled this ball with the pin bang in the center of my middle finger hole. and swung out the CG. The polish made such a huge difference to the ball reaction. This Polished version slides through the heads with ease and makes a sharp turn on the backend. This resulting in a strong entry angle and unbelievable carry. If your a bowler who likes to see pins fly and messengers kick out your corner pins,, Well then be sure to invest in one of these bad boys. This is one of the most versatile balls I have ever thrown in my years bowling. I Drilled this BuzzBomb with the Pin under my bridge and the CG swung out, This resulting in the ball needing a weight hole punched in the side of it. I had read the reports on this ball and heard all the hype. The hype was confirmed when i threw this ball. It really does hook that much!! If you are a bowler with medium- Low revs this ball is ideal for you. Or for higher rev players who play on a long pattern you will not be dissapointed. This ball makes Out of Bounds look like they dont exist. A very strong contender for Ball of the year i think! !